These Silver Eagles are from the 2018 United States Mint Congratulations Sets. The distinctive sets included a special mint-produced presentation folder with space inside to write a personal message, presumably to a recipient who was receiving the set as a gift to acknowledge an important event or milestone like a wedding, graduation or anniversary. These sets were comprised of proof Silver Eagles minted exclusively at the West Point Mint. 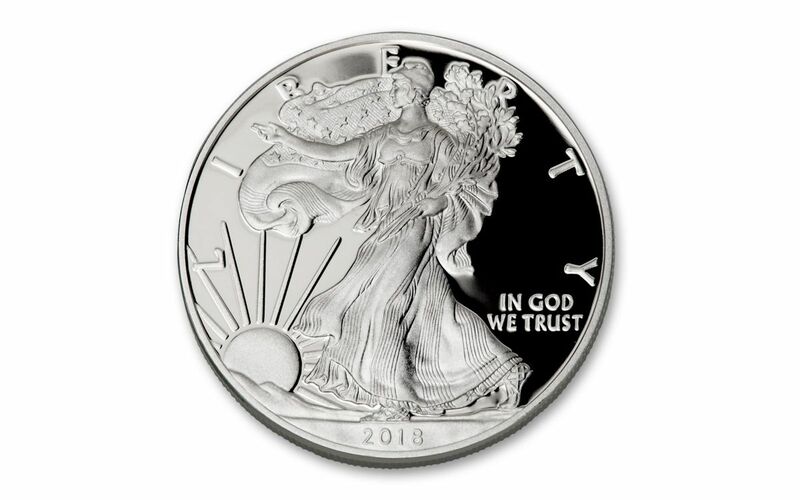 Compared to other 2018-dated Silver Eagle Proofs, these are much more limited. How limited? They’re actually 15 times fewer – with the mintage for Congratulations Proofs set at just 17,862 compared to 268,006 for regular-issue proofs! 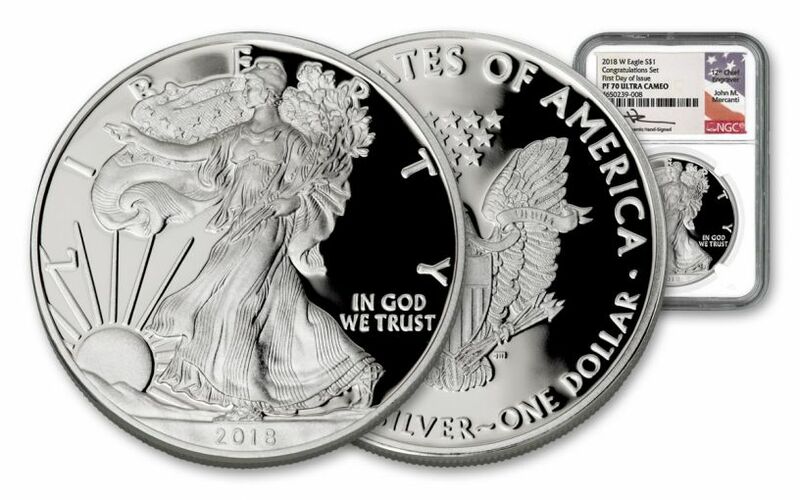 Each of the 2018-dated Congratulations Silver Eagle Proofs available in this offer have been graded by the Numismatic Guaranty Corporation (NGC) to be in perfect Proof-70 Ultra Cameo (PF70UC) condition, a distinction that means your perfectly graded 2018 One-Ounce Silver Eagle “Congratulations” Proof will have ZERO imperfections – showing all features and fields exactly as the engraver and mint intended. In addition, your proof will be certified as a First Day of Issue (FDI) coin by NGC – independent authentication that your coin was released by the mint during the premier day of the series' issue! If that wasn’t enough, your proof will also have a special label personally signed by John Mercanti, the U.S. Mint’s 12th Chief Engraver and the genius behind the Heraldic Eagle design on the coin’s reverse. The label and your proof will be sonically sealed in an acrylic case – giving you the best in protection while granting clear sightlines into every beautiful detail. Here’s where the scarcity reaches epic levels: Currently NGC reports that only 168 of the 2018 Congratulations Silver Eagles graded in Proof-70 condition have Mercanti signatures – and we have them all! An opportunity like this doesn’t come along often. Give one of these Congratulations Silver Eagles to the one you love – even if it’s yourself! EXPERTLY STRUCK IN HIGHLY PURE SILVER – The craftspeople of the U.S. Mint are known around the world for their skill and attention to detail. It's this talent that transforms each one-ounce planchet of 99.9% fine silver into beautiful pieces of numismatic art. 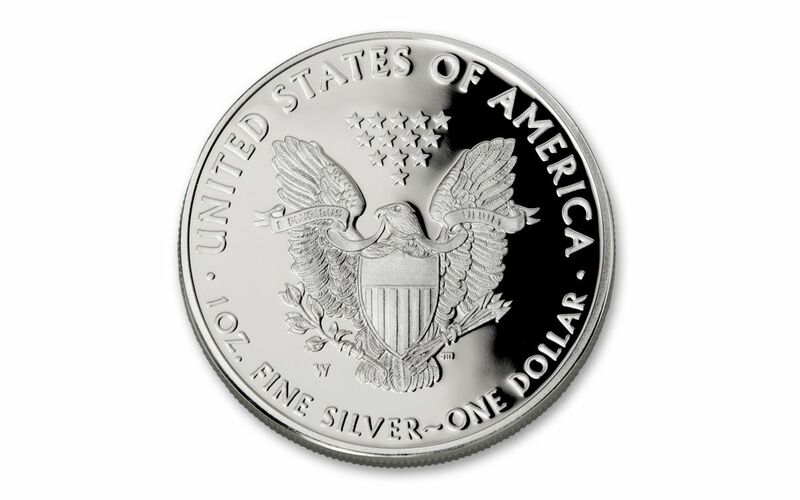 U.S. LEGAL TENDER – Each 2018 Silver Eagle bullion coin is one dollar United States of America legal tender, as seen on the coin's reverse. 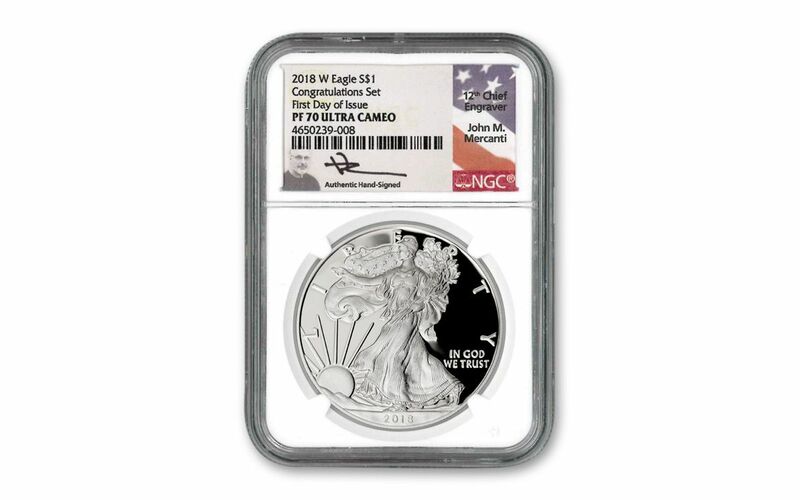 CERTIFIED FLAWLESS – Your coin has been graded by the Numismatic Guaranty Corporation (NGC) to be in perfect Proof-70 Ultra Cameo (PF70UC) condition, a distinction that means your perfectly graded 2018 One-Ounce Silver Eagle Congratulations Proof will have ZERO imperfections – showing all features and fields exactly as the engraver and mint intended! KEY FIRST DAY OF ISSUE CERTIFICATION – In addition, your proof will be certified as a First Day of Issue (FDI) coin by NGC – independent authentication that your coin was released by the mint during the premier day of the series' issue. AN AUTOGRAPHED LABEL! – Your Silver Eagle will also be sonically sealed in an acrylic holder, giving you the best in protection while granting clear sightlines and perfect visual contrast for every beautiful detail. Inside that holder, you'll find another phenomenal feature – a label personally signed by the designer of the Silver Eagle's reverse, 12th Chief Engraver of the U.S. Mint John Mercanti! EXTREMELY LIMITED QUANTITIES AVAILABLE – With a limited mintage of just 17,862, the 2018 One-Ounce Silver Eagle “Congratulations” Proof is 15 times scarcer than regular-issue proofs. Of that total, NGC currently reports that only 168 of the 2018 Congratulations Silver Eagles graded in Proof-70 condition have Mercanti signatures!